V Findlay Wolfe BLOG: coming along! The top half of my Everything But the Kitchen Sink Quilt using T-Shirts is complete! Now to finish adding the bottom half! Such a joy blast of color!!! That is an awesome quilt, but all the more because you made it from t-shirts. 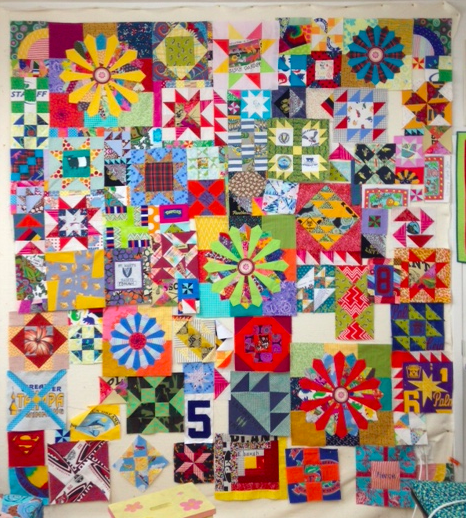 I have made a few commission quilts out of garments but nothing that elaborate...............WOW!!!!!! i like your twist on the t-shirt quilt, raising the bar. Woohoo! Best t-shirt quilt I've ever seen. Love, love, love! So much scrappy inspired goodness. Yay! Amazing that this has been made from t-shirts! Love it. Oh Victoria! It Looks Fabulous!